317 Bow Lane, Middletown, CT.
From birth to death, it is the Master’s plan as to what our lives will entail. L.C. Williams departed this earthly realm on Monday, April 1, 2019. The son of the late Rubin and Alberta Mack was born on January 31, 1923, in Columbia, South Carolina. This story chronicles his life commencing with his Armed Services pursuits. Big Man, as L.C. was affectionately called by many, enlisted in the Army in July 1943 and was honorably discharged in February 1946 where he served as a Sergeant. As he grew older, he loved sharing stories about his time served during World War II in Italy and the Philippines. During his military service, he received a WWII Victory medal, APT service medal, EAMET Service medal, in addition to Philippine and American theater ribbons. Shortly after being discharged, he relocated to Connecticut where he met the love of his life, Carline Cooper. They united in holy matrimony in 1953. God blessed their forty-two year union with five beautiful children: Leroy C. Williams, Larry C. Williams, Lenore C. W. Holloman, Lemar C. Williams, and Lethe C. W. Cannon. For over thirty-five years he worked as a contractor, specializing in plastering. While driving around New Haven, he often pointed out buildings that he helped build with his two hands. Through the years, he grew to love playing and watching golf among other sports. He was an honorary member of the Ashanti Club of Connecticut with whom he enjoyed numerous golf retreats. His other hobbies included putting together puzzles, listening to music, and playing fetch with his granddogs, Brutus and Princess. He possessed a great sense of humor and had a winning and captivating smile. L.C. was a faithful member of Christian Tabernacle Baptist Church until his illness and subsequent departure. L.C. leaves to cherish his memory his sons, Leroy C. Williams of New Haven, CT and Larry C. Williams (Constance) of New London, CT; seven grandchildren, Latresa, Craig, Lindsey, Lakeithia, Catrice, Lauren and Courtney; twelve great-grandchildren, Cavion, Ca’maree, Cardell, Carmelo, Cedric, Catyela, London, Kyenon, Camora, Kennadi, Camilla and Kayden. There are far too many caring friends who extended their love, kindness, and support that have helped to sustain the family and will continue to do so. While we will miss his earthly presence, it is with open arms and hearts that his parents, Rubin and Alberta, devoted wife Carline, beloved children Lenore, Lemar, and Lethe stand in the forefront to shepherd him to his heavenly home. 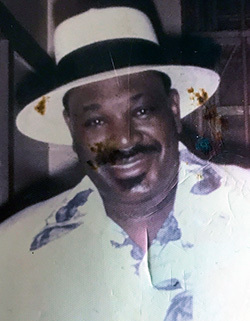 He was also predeceased by his sister, Lottie Poindexter, daughter-in-law Patricia, Y. W. Williams, as well as two grandsons, Cedric L. Williams and Lance C. Williams. A celebration of Mr. Williams’ life and legacy will be held Monday, April 8, 2019, at 11:00 a.m. at Christian Tabernacle Baptist Church, 425 Newhall St., Hamden. Viewing and visitation will be held at the church from 9:00-11:00 a.m. Burial will be Tuesday, April 9, 2019, at 12:00 p.m. in the State Veterans’ Cemetery, 317 Bow Lane, Middletown, CT. In lieu of flowers, memorial contributions may be made to The Christoph Foundation, Inc., 130 Springside Ave., New Haven, CT 06515. Our family in North Carolina have very pleasant memories of ‘Cousin LC’. May he Rest In Peace! To Leroy and family I am so sorry about the loss of your father u have my deepest condolences he was a very nice man and may he rest in piece!! Sorry For Your Loss Ya’ll Have My Deepest Sympathy and Prayers. Our condolences to you and your family on the passing of your father. My god continues to bless you and the family.